Derek Warfield, singer, songwriter, historian and ex-leader of the recently split Wolfe Tones, is back with his new album. This album focuses on the Irish songs, the ballads and the musical and lyrical legacy of colonial rule in Ireland. This album is produced with all the same style and tradition that existed in the magic of the Wolfe Tones. More importantly, this album was made to commemorate the twentieth anniversary of the hunger strike of 1981. It is a tribute to the ballad tradition and its role in recording our history and the native view of the events that have affected the communities in Ireland. Derek Warfield pays tribute to the many aspects of Ireland's rich culture of ballads. In the Irish song and ballad tradition there are many components that make it such a powerful literary and musical story. "Slán Abhaile" is a mixture of new compositions and old popular favourites, but they all give expression to events and people that were important to the Irish society in which Warfield has performed in over the last 40 years. In all the songs on the album, there is great symbolism in which Warfield expresses his love for Ireland. He pays tribute to Michael Gaughan, the patriot from Ballina Co. Mayo, who died on hunger strike, in the touching 'Take Me Home To Mayo'. He also sings the well-known 'Sean South of Garryowen and Old Skibereen', a song made famous by Liam Neeson in the film "Michael Collins". He, also, tells the story of the murder of Aidan McAnespie, a nationalist gunned down by a British Paratrooper. This album is a far better offering than the one made by his ex-Wolfe Tone colleagues, in "You'll never beat the Irish", which has turned out to be a bit of a disaster despite the publicity it has received. Perhaps, it is the way that Warfield keeps to his old successful formulae of using his music to commemorate, celebrate and highlight issues of old, which have effected and are common to all Irish people. However, this is nothing new from Derek Warfield, as he has always managed to beguile his audiences around the world with his words, music and charismatic presence. In Derek Warfield, we have an artist, who is bringing Irish ballads and old traditional music into this new century for the new generation coming through, thus keeping this style of music popular and ensuring its existence for the foreseeable future. 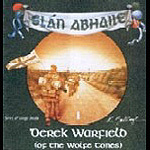 For me, this album, "Slán abhaile", demonstrates Derek Warfield and Irish ballads at their best.